Heat oven to 450°F. Make pie crust as directed on box for One-Crust Baked Shell using 9-inch glass pie pan. Bake 9 to 11 minutes or until lightly browned. Cool completely, about 30 minutes. Meanwhile, in 1-quart saucepan, combine gelatin, 1/2 cup of the sugar, the lime juice, water and egg yolks. Cook over medium heat 6 to 7 minutes, stirring constantly, until mixture boils and thickens slightly. Remove from heat; stir in lime peel and food color. Pour mixture into large bowl. Refrigerate until mixture mounds slightly, about 45 minutes. In large bowl, beat egg whites with electric mixer on high speed until soft peaks form. Gradually add remaining 1/2 cup sugar, beating until stiff peaks form. In small bowl, beat whipping cream until stiff peaks form. Gently stir egg whites and whipped cream into cooled lime mixture. Spoon into cooled baked shell. Refrigerate until firm, about 2 hours. Serve topped with sweetened whipped cream. Store in refrigerator. Pasteurized eggs are uncooked eggs that have been heat-treated to kill bacteria. Because the egg whites in this recipe are not cooked, be sure to use pasteurized eggs. They can be found in the dairy case at large supermarkets. 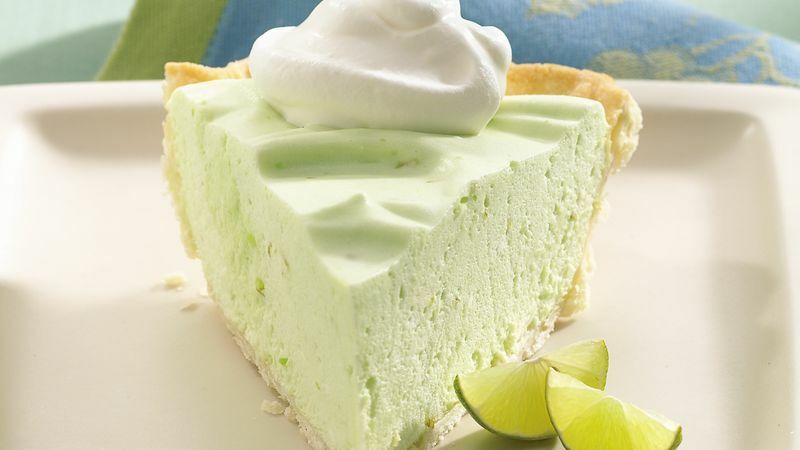 For true Key lime flavor, use Key limes in place of regular limes for the lime juice. Key limes are smaller than regular limes and have a distinct aroma. Pie baking can be even easier when you use Pet-Ritz® frozen pie crusts. Find them in the freezer case with a precrimped edge, ready to use. The disposable pan makes clean up a snap.